Terex Corporation - Investor Relations - Why Invest? 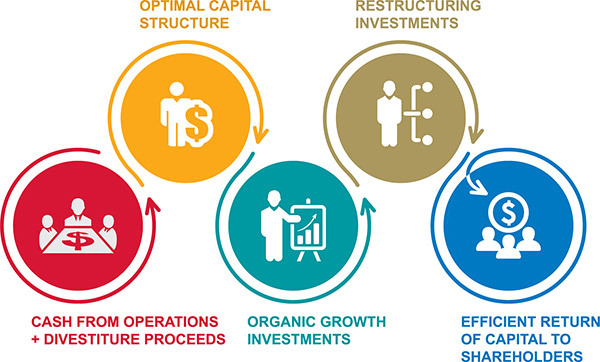 Focus the portfolio on businesses best positioned to generate returns above the cost of capital through the cycle. Simplify company structure, systems and footprint to improve efficiency and enhance global competitiveness. Execute to Win, driving process discipline, execution rigor, and accountability in core processes. The “Focus” element of this strategy, essentially completed in 2017, was to concentrate our business portfolio in product categories where we are among the top three competitors and a market leader. This resulted in divesting two and retaining three core business segments, Terex Aerial Work Platforms, Terex Cranes, and Terex Materials Processing. The “Simplify” element of the Terex strategy is centered on complexity reduction and cost management. We continue to work aggressively to flatten and streamline our administrative processes leading to significant reductions in SG&A spending. We are also simplifying the Company’s manufacturing footprint by reducing the number of production facilities, sharing facilities across businesses, and driving aggressive productivity improvement within the facilities that we operate. Over the last two years, through improved productivity and efficient outsourcing we reduced our manufacturing footprint by approximately 27% while maintaining production capacity at prior levels. Strategic Sourcing will involve implementing a standard, Terex-wide strategic sourcing process that will help us leverage our spending, with the goal of achieving significant savings from an optimized supply chain. Commercial Excellence is about driving process discipline and execution in our commercial operations, such as sales, pricing, marketing, and sales support. 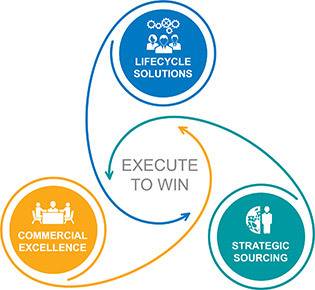 Lifecycle Solutions delivers comprehensive solutions integrating our equipment and other offerings such as financing, spare parts, technical and repair services, operator training, and technology solutions that drive customer satisfaction, loyalty and ROIC. In 2017, using primarily asset sale proceeds, we repurchased ~$925 million of equity representing ~24% of outstanding shares. Our goal is to repurchase $1.0 – $1.5 billion in equity by 2020. Investing in Terex Corporation’s common stock involves certain risks. You should carefully consider the risk factors described in the most recent Terex Corporation Annual Report on Form 10-K and the risk factors set forth in Terex Corporation’s other SEC filings before deciding to invest in Terex Corporation common stock. Such risks and uncertainties are not the only ones Terex faces. Additional risks and uncertainties not presently known to us or that we currently deem immaterial may also impair our business operations. The information set forth on this page includes forward-looking statements regarding, among other matters, our intent, belief or current expectations about our business. These forward-looking statements are subject to risks, uncertainties and assumptions. Actual events or our actual future results may differ materially from any forward-looking statement.